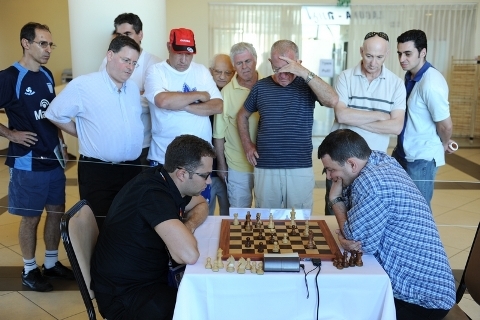 The Maccabiah International Chess Festival 2009, part of the 18th Maccabiah Games, is taking place on 12-17th July at Blue-Bay Hotel, 37 Hamelahim Street, Natanya, Israel. 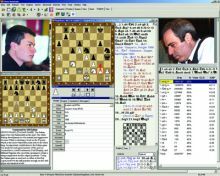 The main event is the Richard Riordan Chess Festival – a rapid super-tournament including 13 grandmasters. Initially the participants were twelve, but the organizers added GM Ian Nepomniashtchi, which caused a player to get a bye each round. 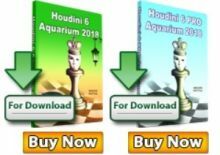 Ten out of the thirteen participants are among the top 100 players in the international rating list of FIDE. 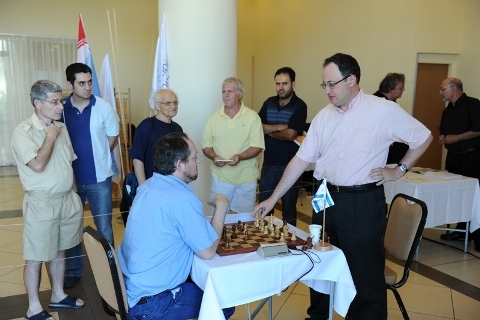 In addition, it is noteworthy that Boris Gelfand, Boris Avrukh, Michael Roiz and Maxim Rodshtein were members of the Israeli team which took silver medals in the World Chess Olympiad in Dresden, Germany. The last round, with the extreme tension involved, brought off some surprising results. 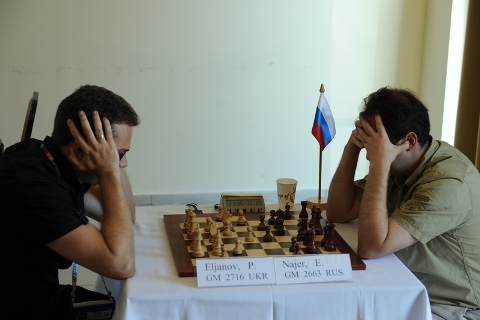 Emil Sutovsky, who up to this round lost almost all his games, decided nevertheless to fight for a win against the leader Evgeny Najer, and mated his opponent after a short, brilliant game. Evgeny, however, didn’t lose the gold medal, as his main rival Ian Nepomniaschi tried an unsuccessful desperation attack which led to his defeat against Boris Avrukh. Even so, the two Russians had a fantastic tournament and they are indeed worthy winners. The bronze medal went to Alexander Beliavsky after drawing against Golod. Judit Polgar, who could endanger him lost to Gelfand in the final game to finish. Smirin and Eljanov gave up their hopes for a share of 3rd after playing a short draw. 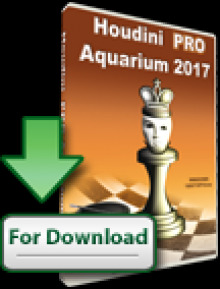 Maxim Rodshtein reached 50% after a concluding win over Daniel Fridman.